For custom size and print, https://www.signsbannersonline.com lead the way for wholesale printed custom banners for graphic design firms and advertising managers. They supply direct, have products that are best quality and you can upload to print. I recommend you navigate around their YouTube channel to see more of what they do. Custom sizes... you do not need a minimum roll or height... Printed Fence Screen is an inexpensive solution offering full color design, personality, privacy and the ability to change the look of any fence cost effective logo application when multiple repeat logos are needed. New digitally printed fence screens offer the opportunity to beautify the construction site and benefit of promoting the store brands added to the project. Also add on safety messages and safe work logos. 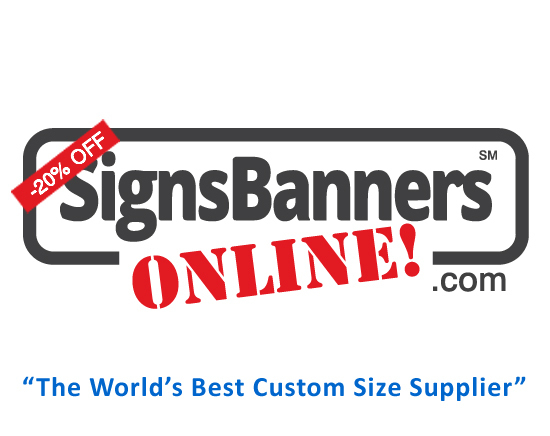 Signs Banners Online use the best mesh banner for fence wraps and site covers. Tip: The printing technique is disperse sublimation ink which penetrates the material = no scratch. Put together by the exhibitor warehouse team so you can see how it works, the mesh is tied to the fence using hooks and plastic cuffs zip ties. It is preferred by exhibitor retailers because: Closer weave pattern is superior to shade cloth prints. Full color graphics, photo-graphics and client illustrations are better reproduced. No minimum size required. Custom made sizes and lengths allow contractors to use differing artwork and site locations for each project more effectively. Extra Feature: DBFM banner media is engineered with a print receptive treatment and when printed it displays a wide array of vivid colors with outstanding color consistency.